2016: Played in 49 games with 47 starts, primarily at shortstop … Ended the season with a .233 average with 23 scores and 18 RBI … Also walked 18 times to take on-base percentage up to .307 … Started all 21 conference games, hitting .207 with seven runs and six RBI … Registered first hit of the season against Northern Illinois (March 6), hitting a grand slam to help the Aces to a victory … Ended 2-for-5 with two walks, a season-best four scores and two RBI in win at UT Martin (March 8) … Starred in doubleheader at Eastern Kentucky (March 26), going a combined 5-for-7 at the plate … Knocked in a career-best five runs in a 3-for-5 showing against SIUE (March 29) … Also enjoyed strong series at Missouri State, finishing 5-for-11 with five walks, five runs and three RBI to help the Aces to a series victory over the 16th-ranked Bears … Recorded at least one hit in 27 games and multiple hits in 15. 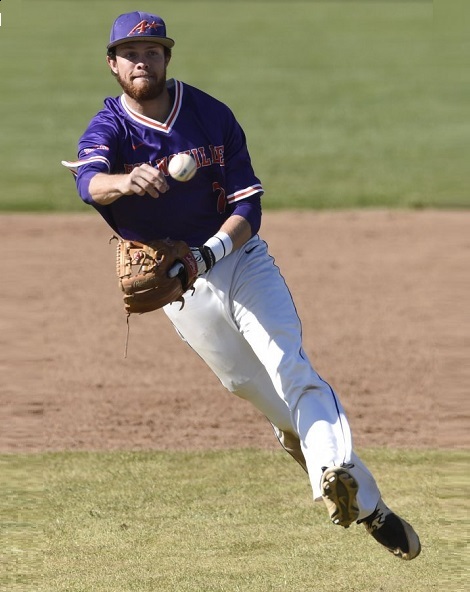 2015: Missouri Valley Conference Honor Roll…Appeared in 46 games, making 41 starts…Finished eighth in the Missouri Valley Conference in assists (139)…in league play, ranked first in assists (70), second in fielding double plays (16), and seventh in sacrifice bunts (three)…Began the year as a reserve but became the starting second baseman following a broken hand to infielder Boomer Synek…Recorded his first career hit vs. Western Illinois (Mar. 6)…Stole the first base of his collegiate career vs. SIUE (Apr. 14)…Became everyday shortstop following a broken hand to infielder Shain Showers…Scored career-best three runs vs. Oakland City (Apr. 29)…Season-high five game hit streak (May 9 – May 20). PREP: Two-year letter winner at Lyons Township for head coach George Ushela…Helped the Lions to a state championship appearance in 2012…Played summer ball for the 29ers and head coach Todd Lawler…Hit .452 with 13 stolen bases for the 29ers, leading them to a 30-4 overall record and state tournament title in 2012.